The Opificio delle Pietre Dure (Laboratory of Hard stones) was established by the powerful Medici family in 1588 to specialize in creating semi-precious mosaics and inlays. Normally closed to the public, we have exclusive access to enter, so you can see its exquisite collection kept in the Fortezza da Basso, (the Fortress of St. John the Baptist), the largest work of the modern fortification inserted in the walls of fourteenth-century Florence. Your private English-speaking guide will lead you through the wonderful collection of 16th century sculptures, wall paintings and precious textiles. You will also visit the laboratory itself to see the artisans hard at work keeping this precious art alive. 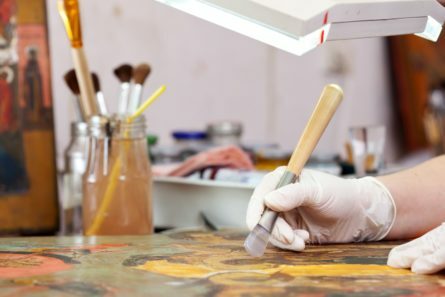 A dedicated restorer will be at your disposal to show you the current restoration projects and reveal the secrets of this centuries-old art.